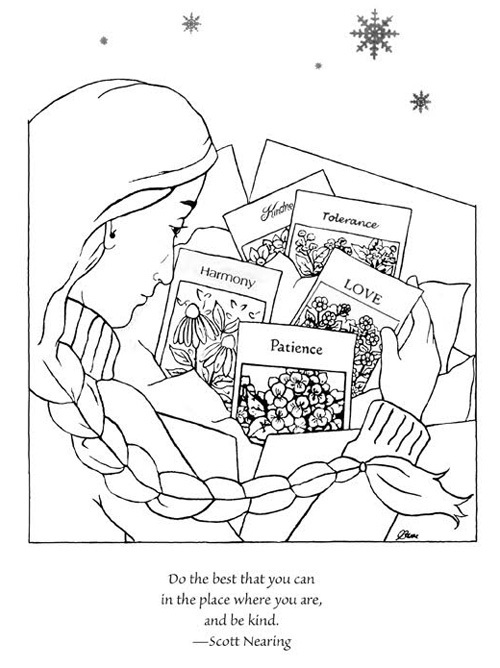 When we were children we loved to bring out our cherished magical crayons and color “inside the lines” in our coloring books. 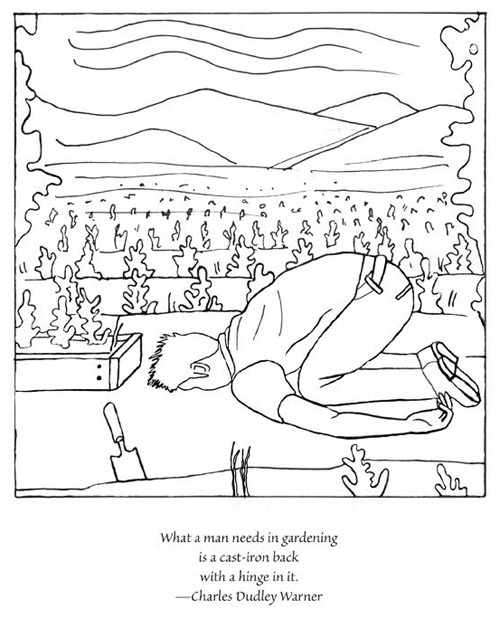 And apparently we have not forgotten that delightful creative activity, for, as adults, we are buying Adult Coloring Books by the thousands and rekindling our love affair with interpreting someone else’s line drawings with our own imaginations! 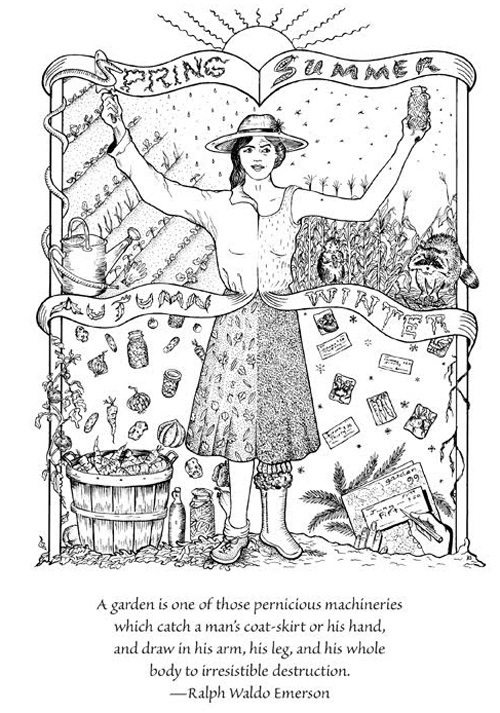 One such offering that will especially appeal to gardeners, is the newly released Great Garden Quotes: A Coloring Book with Wit, Wisdom, & Heart from GreenPrints, longtime publishers of much the loved GreenPrints Magazine. 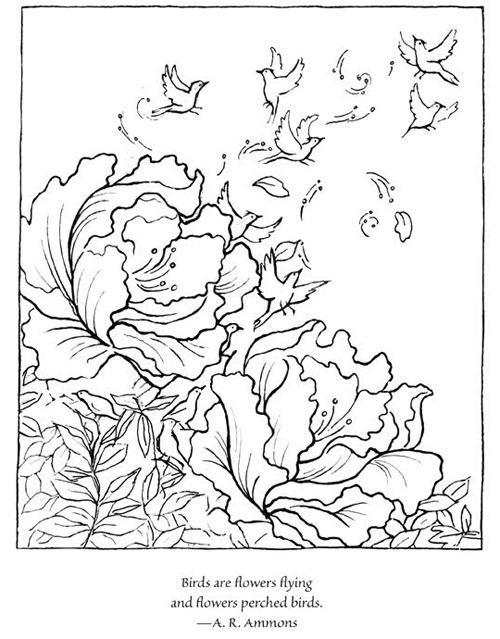 Here are some pages from this lovely addition to the Adult Coloring Book choices. 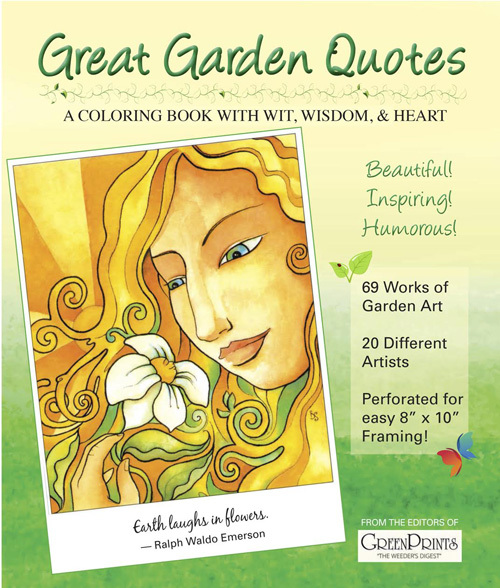 Each page carries a lovely quote that will touch and tickle a gardener’s heart! 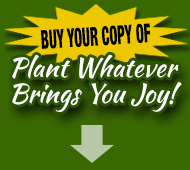 GreenPrints editor Pat Stone says the idea to publish a coloring book was not his idea! 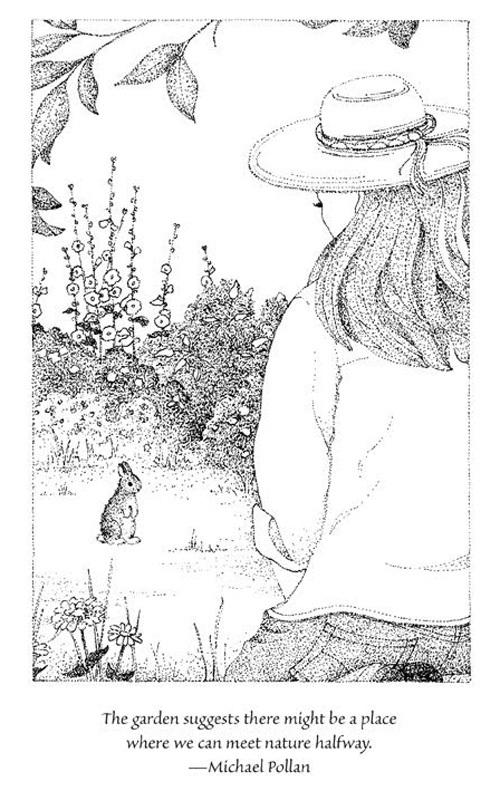 “Sure, I’ve been publishing remarkable black and white art in GreenPrints for over two and a half decades. 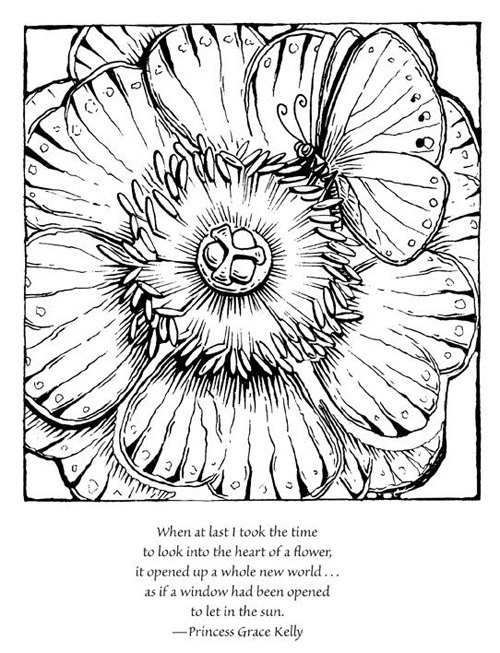 But I never thought of sharing it in a coloring book–not until a subscriber called in and said, ‘I’ve loved your magazine for years and years. And after I read the stories, I color in every page! 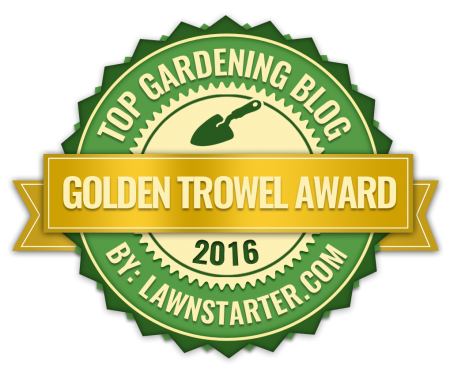 '” And the seed was planted for this book. 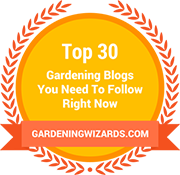 If you or someone you love would like a copy of Great Garden Quotes, you may order a copy from GreenPrints by phone (800-569-0602), by mail (GreenPrints, P.O. 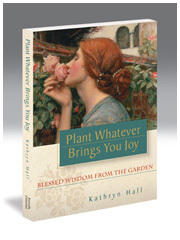 Box 1355, Fairview, NC 28730) or at amazon.com Great Garden Quotes costs $14.95 plus $3.00 for shipping and handling. I think it’s a marvelous fun thing to do in winter! I hope you are enjoying the magic of winter in its many manifestations around the globe. 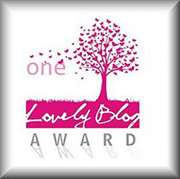 It is a special time, a unique and calming beauty in all its forms. 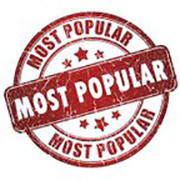 I appreciate all my readers and subscribers and I welcome your comments below. 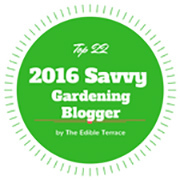 Also, many thanks for this Top 50 Gardening Blogs of 2016 Award, just received!